Frances Brody had been acutely aware for the longest time that Jewish continuity -- linking past generations to future ones -- is precious. FRANCES: "In 1950, I went to Israel on a quest, hoping to find members of my family who might have survived the Holocaust. That visit sparked my love of Israel and my passionate dedication to the Jewish State. I believe Israel is a bastion of world learning and scientific progress." 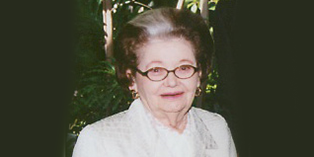 Following her celebrated career as a chief executive in international commerce, Frances had become a major force in philanthropy, which she extended to Tel Aviv University. With a bequest provision to AFTAU in her will, she established an Institute for Applied Diplomacy at the University. Her Institute, which will be named the Frances Brody Institute for Applied Diplomacy, will nurture a new level of professionalism in Israel's diplomatic corps, and enhance Israel's representation and status globally. FRANCES: "If we truly believe individuals can and should be educated, then why not include diplomats who play such a vital role in the world's view of Israel?" Through a deduction for the full value of the endowment fund at the time of her demise, her bequest provided her estate with significant estate tax savings and is a source of pride for her surviving extended family. And it will provide her beloved Israel with an innovative, meaningful and important gift.